Bei 52CCT heißt das Motto der Farben-Challenge im September Rot, Weiß und „Kraft“… was ich als Pappe interpretiere. Den kleinen Wicht in seinem wunderbaren Pullover habe ich schon lange in meinem Vorrat – es ist kein Stempel, sondern war mal Streudeko, mit vielen Freunden. The September Color Challenge at 52CCT is about Red, White and Kraft. The little guy in the adorable sweater has been in my stash forever and is not a stamp but was part of a ready-made package for decoration. Wie gesagt, mein Wochenende war kreativ… Und bei der „Au Natural“ Challenge von Holly Jolly hat es ein „Top Pick“ gegeben – das sind nicht die Gewinner des Preises, aber jedes Mitglied des Design Teams wählt unter allen Teilnehmern seine Lieblingskarte aus. Danke, Paige! So kann es weitergehen… Und nun: bis bald! As I said: my weekend has been creative… And it’s paid off already: I was Paige’s Top Pick at last week’s „Au natural“ challenge at Holly Jolly– thank you, Paige! Maybe I’m on a lucky streak… For now: take care! Congrats on your win! 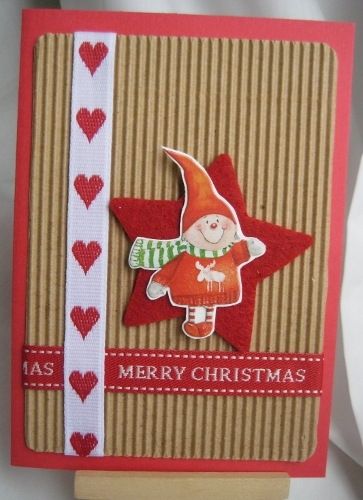 I love this card and the colours … I really like the corrugated card and ribbons … it’s very Scandinavian! Congratulations! This little guy is so cute! Oh this is so cute! Great texture with the corrugated background! Thanks for playing along with 52CCT this week! 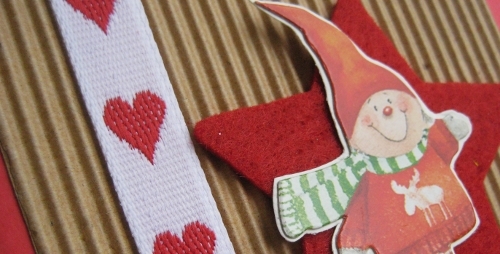 I love this little fellow he is so cute and love the hearts on the ribbon too. Oh what great texture! A terrific card – so glad you joined us this week at 52CCT.